Gov. Gretchen Whitmer campaigned on the promise that she's going to fix the roads, but her gas tax plan has hit some speed bumps with drivers worried about paying more at the pump. (WXYZ) — Gov. Gretchen Whitmer campaigned on the promise that she's going to fix the roads, but her gas tax plan has hit some speed bumps with drivers worried about paying more at the pump. 7 Investigator Heather Catallo sat down with Whitmer to get some of your questions answered about her plan to fix the roads. Whitmer told Catallo that she's just as tired as you are of empty promises about the state's crumbling roads. She introduced a plan that will ultimately raise the gas tax by 45 cents a gallon , but we wanted to know if that is the only option. "I don't want to raise the gas tax, I would rather we're not in a position," she told Catallo. "But after 40 years of disinvestment, we have a crisis on our hands, and we need real solutions, not talking points." Whitmer's budget plan calls for increasing the gas tax 15 cents three times over the next year and a half. That would bring the total state gas taxes to 71.3 cents a gallon, on top of Michigan's six percent sales tax. The governor says that will raise the $2.5 billion that's needed each year to bring our roads back to good or fair condition -- and Whitmer says the gas taxes would constitutionally be required to only fund roads and bridges. 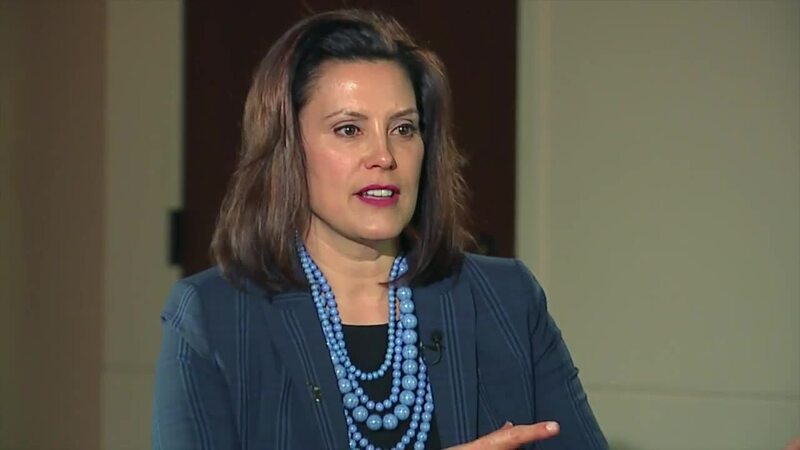 "This isn't just like sending money to Lansing, in the general fund, and hoping the legislature appropriates the money," Whitmer said. "This is a guarantee. And it's the only way we can guarantee the dollars with where we say they're going to go." As we help you get around metro Detroit, many of you have asked, why can't our pleasant peninsula raise funds some other way? "Are toll roads an option?" Catallo asked. "One of the downsides when you talk about infrastructure is we are a destination state," Whitmer said. "Unlike Ohio or Pennsylvania or Illinois, people don't cut through Michigan to get somewhere else, so as we cut through Ohio on our way to Florida or wherever we're headed, they're on a position to get out-of-staters to pay for part of the roads." Whitmer says toll roads would really just tax us, and the funds would go into the general fund, meaning they're not guaranteed to fix the roads. We'll have much more of Heather's entire interview with the governor on 7 Action News all day on Tuesday.